Is quad-core really better than dual-core? do specs even matter anymore? ok, If you like me are up to date with what's happening in the mobile world, you know that's there's a battle of the smartphones going on between iPhone5, Samsung and Lumia (eventhough, it isn't even out yet). and their choice of weapon? Specs! There are a million and one specs comparison tables between these 3 "heavyweight"
But at the end of the day, do these comparisons really matter, iPhone fans are always going to buy iPhones even if its maps turn by turn navigation guides them into the grand canyon. Samsung and Fandroids are still going to get a Galaxy S III even if they know that one drop from 4 feet can potentially shatter its humongous screen. Nokians will always buy Nokia, even though the Symbian OS isn't up to date with current times, or that windows phone is boring and flat. My point is these specs comparison between phones don't matter to anyone who has pledged his/her allegiance to a platform. it's like the general elections coming in November, say someone releases a video showing republican candidate Mitt Romney dissing 47% of Americans that wouldn't stop members of his party from voting for him. Specs comparison should be obsolete, no one should be choosing a phone based on screen size, if you complain that 4inch is too small for you to see then I wonder how you coped all those years before the touch screen era when phones had 1-2inch screens. Many of these phone manufacturers boast of haveing the longest lasting battery, but if you are a heavy user like me, then all that wouldn't make a difference, your battery would be dead by the end of the day regardless. Unless you plan on printing a "empire state building" sized poster of a photo you took on your smartphone, then megapixels shouldn't really matter to you, research has already shown that 5MP is the ideal size for smartphones, anything higher than that wouldn't make a difference really. The fight for the best smartphone shouldn't be about who's got the bigger screen of a crowded processor. It should be about who is bring something new to the table, who has got the wow factor, we don't want something bigger, we want to see something new, new features, new experiences and new technology. 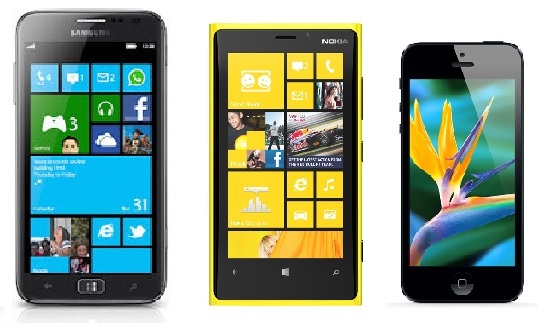 Right now, only Nokia seems to be thriving in innovation, from the Nokia N9 to the Lumia 920. If we don't make it a battle for innovation, then a mere 5 years from now, people will be carrying 7inch phones in their pockets. Actions Speak Louder Than Words “Lumia 920 Low Light Shootout”.